Fiona is the lead chaplain for the Canary Wharf Multifaith Chaplaincy. As a full time employee at the Chaplaincy she acts as the key coordinator for all Chaplains and defines the vision and purpose and objectives for the Chaplaincy. Fiona set up the Chaplaincy in 2004 after recognizing a need for pastoral care for the every growing professional population on the Canary Wharf Estate. Over the years, she has seen the number of workers on the estate grow from 60 000 to 120 000 people and worked to support these workers and the companies in which they work, delivering pastoral care, practical advice and counsel. In addition to her full-time work at the Chaplaincy, Fiona helps out in an honorary capacity as a priest vicar at Westminster Abbey. 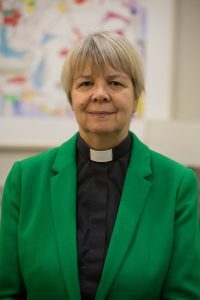 Fiona was first ordained as a deacon in 1991, and thereafter became one of the first women ordained as a priest by the Church of England in 1994. She has been working in Chaplaincy for nearly 25 years, the last 14 of which have been spent working with the business community in Canary Wharf. Fiona was born just outside London. She holds a PHD in Chemistry from Birkbeck College, University of London. Prior to her theological studies, she worked for British Gas as a senior research scientist, researching the cause and prevention of gas explosions. Fiona enjoys reading, particularly crime fiction. She enjoys hosting dinner parties, visiting the cinema and theatre and more recently, the opera. She has a goal to walk the Thames Path with her partner and has so far completed the eastern part of the path from Staines. Fiona has recently published a book describing how the chaplaincy has developed over the years and how faith can make a positive contribution to the workplace. Her book is called ‘Multifaith Chaplaincy in the Workplace, How Chaplains can Support Organisations and their Employees’, published by JKP, 2017. A copy of the book can be purchased by following this link.